Who knew a monstrous Saturnian hurricane could look so lovely? The spinning vortex of Saturn's north polar storm resembles a deep red rose in this false-color image from NASA's Cassini spacecraft. Measurements have sized the eye at a staggering 1,250 miles (2,000 kilometers) across with cloud speeds as fast as 330 miles per hour (150 meters per second). This image was taken from a distance of 261,000 miles (419,000 kilometers) on Nov. 27, 2012, with filters sensitive to near-infrared light. The eye of a super-hurricane at Saturn's north pole looks like a peaceful red rose in a fresh bouquet of pictures from NASA's Cassini orbiter. But don't be fooled: That rosy appearance is merely due to the false colors ascribed to infrared wavelengths. This storm's eye measures 1,250 miles (2,000 kilometers) in diameter, about 20 times wider than the average hurricane's eye on Earth. The outer clouds at the hurricane's edge are traveling at 330 mph (530 kilometers per hour), which would be off the scale on our planet. The vortex whirls inside Saturn's mysterious hexagonal cloud pattern, and it's not going anywhere. "We did a double take when we saw this vortex, because it looks so much like a hurricane on Earth," Caltech's Andrew Ingersoll, a member of the Cassini imaging team, said in a NASA news release on Monday. "But there it is at Saturn, on a much larger scale, and it is somehow getting by on the small amounts of water vapor in Saturn's hydrogen atmosphere." On Earth, hurricanes are fed by warm ocean water. But there are no oceans on Saturn — so what source drives this super-hurricane? Cassini's scientists want to find out, and whatever they find might add to our understanding of storm dynamics on Earth as well. The Cassini team suspects that this storm has been active for years, but Cassini has only recently been able to watch it in visible light. When the bus-sized spacecraft arrived in 2004 to begin its $3.5 billion mission to study Saturn and its moons, the north pole was shrouded in winter darkness. Now spring is coming to the north, and Cassini has shifted to an orbit that makes it easier to see the increasingly sunlit storm. In an email, Cassini imaging team leader Carolyn Porco of the Colorado-based Space Science Institute said the hexagon-ringed vortex is "one of the most gorgeous sights we have been privileged to see at Saturn." But such sights won't last forever: Cassini's extended mission to Saturn is due to end in 2017 with a controlled plunge into Saturn's clouds. To keep up with the mission in its final years, check in on NASA's Cassini website as well as the online home of the Cassini imaging team, and follow @CassiniSaturn on Twitter. A false-color image from Cassini highlights the storms at Saturn's north pole. The angry eye of a hurricane-like storm appears dark red, while the fast-moving hexagonal jet stream framing it is a yellowish green. Low-lying clouds circling inside the hexagonal feature appear in a muted orange color. A second, smaller vortex pops out in teal at the lower right of the image. 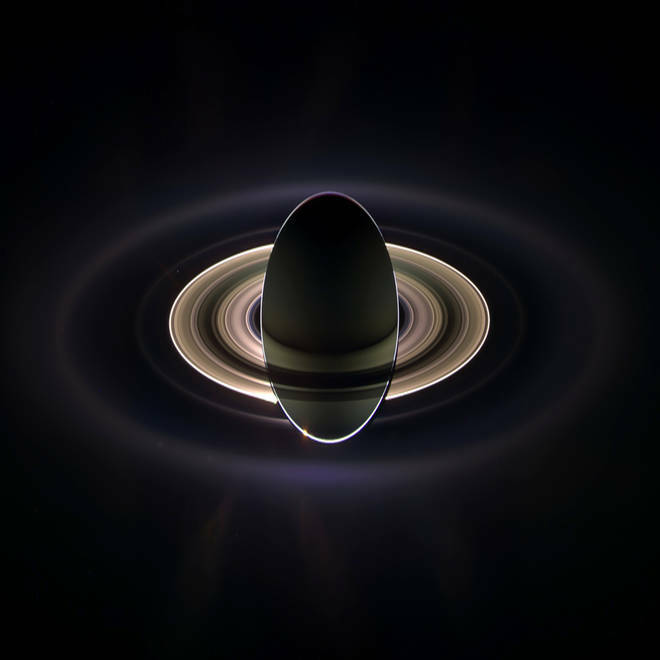 The rings of Saturn appear in vivid blue at the top right. The colors are coded to show different near-infrared wavelengths, which are associated with different altitudes. Andy Ingersoll, a member of the Cassini orbiter's imaging team, narrates a NASA video about a hurricane-like storm seen at Saturn's north pole. The spacecraft Cassini has provided close-up views of a large hurricane at Saturn's north pole that's estimated to be about 1250 miles wide. NBC's Brian Williams reports. Alan Boyle is NBCNews.com's science editor. Connect with the Cosmic Log community by "liking" the log's Facebook page, following @b0yle on Twitter and adding the Cosmic Log page to your Google+ presence. To keep up NBCNews.com's stories about science and space, sign up for the Tech & Science newsletter, delivered to your email in-box every weekday. You can also check out "The Case for Pluto," my book about the controversial dwarf planet and the search for new worlds. 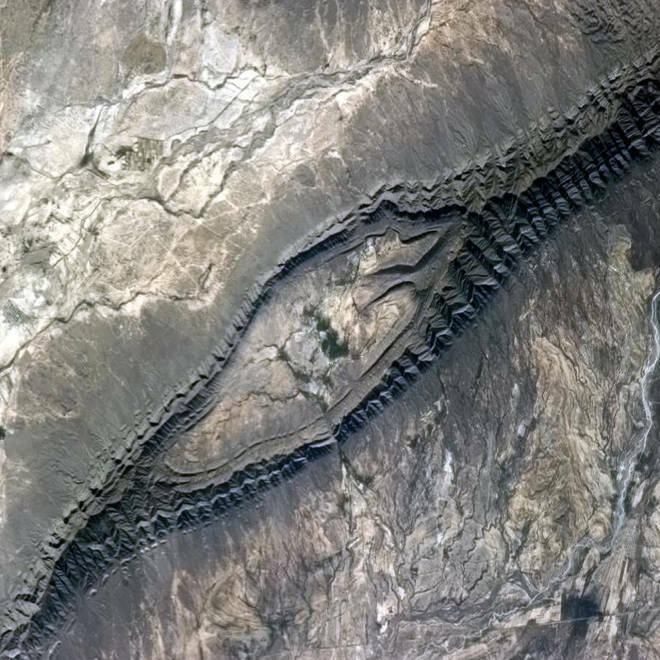 Feast your eyes on an alligator-like mountain range and other curiosities seen from outer space in April 2013.